Emerging female football talents from Perth College and Santa Maria College will battle it out in a nine a side curtain raiser ahead of West Coast’s clash with Essendon at Optus Stadium tomorrow night. West Coast game development manager and 2006 premiership player Adam Selwood will mentor the Perth College group, while the club’s game development head coach and 2011 all-Australian Drew Petrie will coach the Santa Maria side. The pair has conducted training sessions with the middle school boarders in the lead up to the fixture, building on the good work of WA Women’s League stars Courtney Stubbs (Perth College/Subiaco WFC) and Jo Beechey (Santa Maria/East Fremantle WFC). Beechey said her charges could not wait to show off their skills at Optus Stadium. “I don’t know who’s more excited – the players or the parents,” Beechey said. 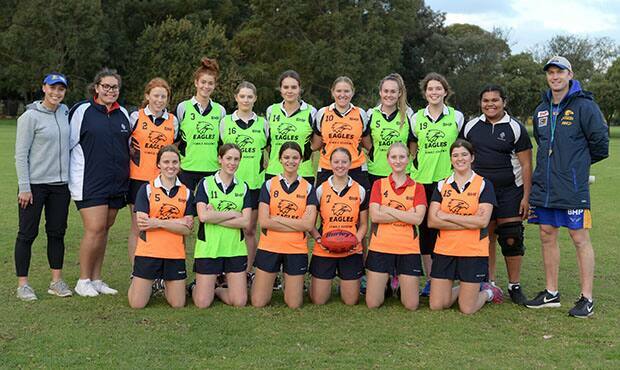 Perth College will wear West Coast’s Female Academy jumpers, while Santa Maria will don the club’s orange Female Academy kit. Most of the players featuring the in curtain raiser are relatively new to AFL but will relish the opportunity to play on Perth’s biggest sporting stage. Gates open to the public at 4pm and bouncedown for curtain raiser is 4.10pm.